This was billed as my favourite ride and it didn’t disappoint today. 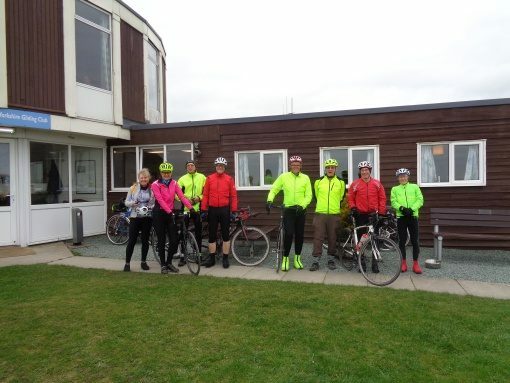 We started with around 24 riders from Hornbeam and arrived back at Ripley with 18. The rest left us early. Everyone organised themselves into groups with gaps. I led and Liz F and Liz P made sure that no-one got lost – many thanks to them both. The weather was great for this hilly ride – nice and cool and it was dry. A little sunshine would have just finished off a lovely morning in the Dales. The daffodils were everywhere and the cherry blossom was glorious. There were some great downhills which needed some climbing in the first place. 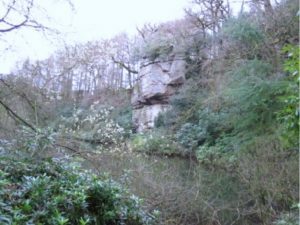 We all enjoyed the long run down from Brimham Rocks past Rabbit Hill Farm and back to Ripley via Scarah Bank. We decided to see if the cafe at Brimham Rocks Adventure Farm could cope with such a large group. The food was great, well priced and served with a smile – it came quickly too. Definitely on my list of places to stop. On a cooler morning than anticipated 13 riders set off to venture into West Yorkshire. There was a need to split into two groups and Janet, who knows the area well, lead the faster riders out towards Kirby Overblow followed by the ‘steady’ group. We lost John fairly soon as he sped off to Wetherby and James followed him as he had an early afternoon engagement which meant he needed to be back early. 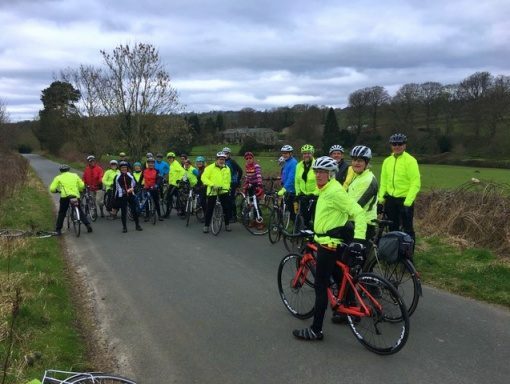 We then negotiated the short stretch of the A61 to Harewood Bridge and set off to climb Weardley Bank which ensured we all spread out and warmed us! We were joined at the top by Sara who had cycled from home and we set off to Bramhope and then on to the Cheerful Chilli for refreshments. Our hopes were dashed as poor pre-planning (by me) hadn’t discovered it was only open at the weekends. 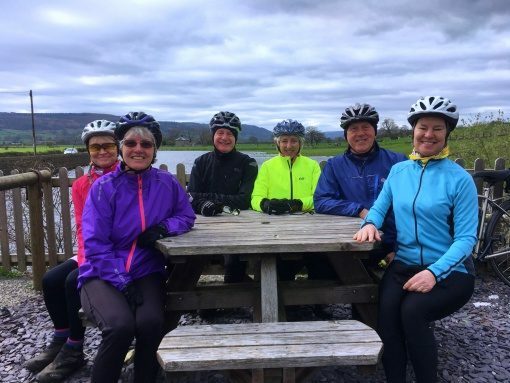 The faster group had gone on ahead and were ensconced in the Bloomfield Square cafe so we, thinking it would be full, set off to Pool and the Farm Shop where we met the Poddling Group who were enjoying their well-earned break. We had a leisurely stop as they were understaffed (but apologetic) and then we prepared to head off. Paul and Gia headed straight back and Sara headed home with the climb of Weardley Bank in prospect whilst the four left (or were they remainers?) in the steady group set off for Castley and then home. We crossed the A61 again and climbed up to Kirby Overblow where the short route home via Pannal was opted for. The day started with a phone call from Norman, to say Theo was coming out to ride, Norman was picking him up at his house along with Bill and they were heading for Wetherby, and where else but Morrisons by the shortest route. A text from Eric told that he was on an awayday in Hawes with Di. Dave P headed to Low Bridge to check out the “A” team, today it consisted of Dave Wilson, Dave Siswick, Geoff and Richard, who were heading in a northerly direction, away went DP to meet up with Dave Watson, a quick chat then away he went to catch up with the “A” team (nearly had a full set of Dave`s out today). 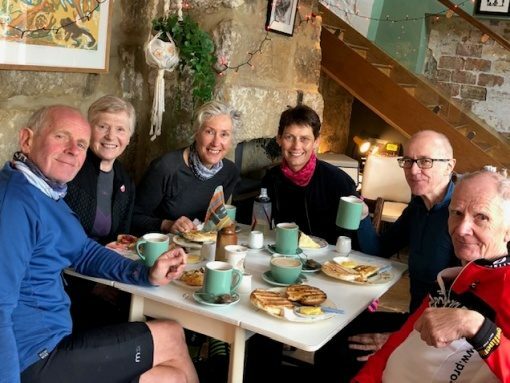 DP headed for Cowthorpe, Rudgate, Walton and in to Wetherby via the cycle track and in to Morrison`s where Bill, Norman and Theo were sitting relaxed enjoying the tea and the ambiance. Nice to see Theo out on his bike and a good opportunity to wish each other “happy new year”. the topics of conversation were wide and varied, but it was noted that because Morrison`s had plenty of room it was handy if any of us Old Un`s had a “funny turn” we could lie on our backs with our feet in the air till we recovered. 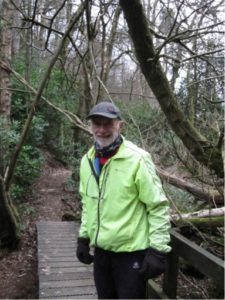 Then it was North via the cycle track to take a left at the Cowthorpe turnoff and into Knaresborough via Waterside, we were led in by Theo (despite him saying how slow he was) with that superb cadence of his, from riding many years on fixed wheel, then up the Beryl Burton track and home. A nice little ride and a few comments on buying electric bikes, and why not. Dave P .